When working with children, you have to be prepared for almost anything – and the same goes for usability testing with them. While being over-prepared is important and necessary, being able to work on your toes is what makes a usability testing experience successful. Testing with children is fun and interesting and you will be surprised what this generation of children is capable of doing with today’s technology. Children are curious by nature and a great way for them to learn new things is by diving head first into something and exploring it. (Curiosity and Exploration) This is an important quality to foster in children and a great way to see what they are capable of doing. Allowing children to explore your product or application is a great way to assess the usability as well as the general interest of your product. 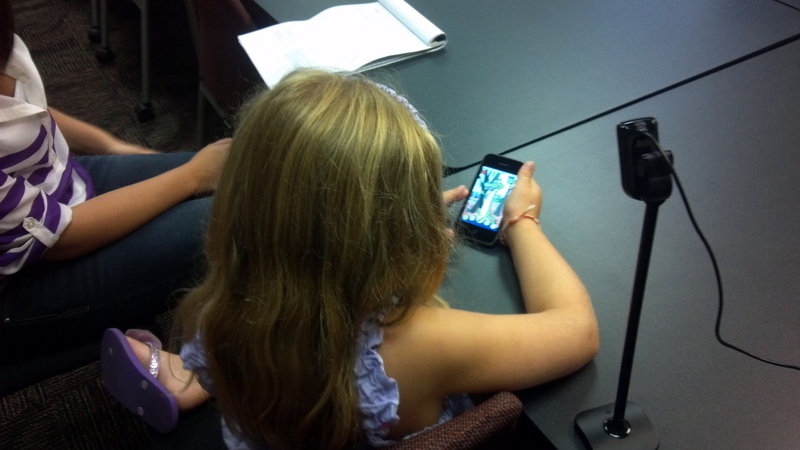 A child explores a Red Privet-designed iPhone application. And while letting them do their own thing is important, having a plan will help you to stay organized in completing the goals of the testing. A usability test plan is where you want to define exactly what you are trying to learn and constitutes the success of your usability test. Creating a test plan with a list of tasks that you want the children to try and accomplish will help remind you what to prompt the child. It will also help you when the child is looking to you to provide them direction of with what to do next. Things won’t go as planned, but you always want to accomplish your goals of measuring the success of your product. If the kids are allowed, and prompted, to explore and approach the tasks as they wish, then being prepared to do tasks out of order is a must. Repeating tasks, especially the fun ones, will also happen. This is the perfect opportunity to observe the children doing the task again and see if the behavior has changed. Parental Involvement will be a crucial aspect to factor in while testing. It is a parent’s instinct to want to help their children with whatever struggles they are having, especially when the child is asking for help. At the very beginning, when you are explaining what you will be doing today, explain to the parents that it is important for you to see what the child can figure out on their own. The parent knows the most about their child, which is important to keep in mind, especially if you are struggling to communicate. Allowing the parents to chime in to help can be beneficial as long as it is not keeping the child from completing the tasks on their own. Plan, but be prepared for chaos. Embrace the opportunity that going off the plan gives you, like repeating tasks. Encourage exploration, and get the parents on board with allowing the children to decide what they want to do and how to do it. Having the appropriate environment for testing will help everyone to concentrate on the completing the goals of the testing. It will also help the tests run smoothly and lessen the amount of problems that could happen. Children are too small for adult sized furniture and equipment. Having the appropriate set up will them feel more physically comfortable and avoid any potential injuries. Do not have exposed wires or sharp objects-they might extend their exploring beyond the product. Having a safe, clean environment will alleviate a lot of stress and liability issues that could occur. Once the child’s safety needs are met, making them feel comfortable is the key to getting them to feel open to exploring and trying new things. Bond with the child before beginning the test. Ask them questions about themselves. What grade are you in? What is your favorite color? These can lead to questions that are helpful to your research, like what their age is. Ask them about themselves; it’s a great way to get them warmed up for the test questions. If you are administering the testing, then your appearance and demeanor is also important. Kids respond well to bright colors and more juvenile clothing (think about what you see elementary school teachers wearing). Also, lowering yourself to physically be on their level will help them to feel less intimidated, and more as an equal. During our testing experience with children, we had computers for taking notes, note takers and numerous cameras and tripods for recording in our testing areas. While the kids were aware of all of this, they didn’t seem to mind them being there or feel pressured because of them. Keeping this stuff at a minimum is still beneficial to help keep the commotion down, but not something to worry too much about while planning for your test. Making the children feel comfortable can be accomplished by asking them questions and by making them feel like you are on their level. Children do not mind cameras and computers in the room. Children do not respond well to open ended questions. Responses to the questions like “What do you think that would do?” were mostly “I don’t know” or a blank stare. A lost child can be successfully directed with questions like “What are our options here?” If a child has a failed attempt at completing a task, a great way to get them to keep going is to ask, “What is a different way to do it?” Also, approaching the child as though they are helping you can help them to understand that they are in charge and that you don’t have the answers. Saying something like “Could you show me how to (insert task)?” or “Could you help me figure out how to (insert task)?” will encourage them to figure it out themselves. Because children have so much curiosity, they ask a lot of questions. They will ask questions about everything and anything and they do expect you to answer. A lot of times when testing with adults, ignoring or not answering a question are great ways to get them to figure it out on their own. This tactic does not work with kids. If you don’t answer their questions, they turn their attention away from the product to you in anticipation for an answer, which you don’t want. So if it is a question you don’t want to answer, try using some of the questions above to keep them going on their quest to complete the task. Kids ask a lot of questions and expect answers. If you want them to answer their question themselves, respond with a question that would help prompt them to explore more. Asking the child to show you or help you complete a task is a great way for them to feel open to figuring it out themselves. Testing with kids is fun! They say funny things and laugh at your jokes. Testing with them will keep you on your toes and push your test giving abilities to the maximum, but it is rewarding and informative. Catering to their curiosity will help make your testing experience a success. Create an environment that lets them explore your product to see what they are capable of doing.